Cost of goods sold showed a 14% increase closing the period at $59.37 million relative to $52.17 million for the corresponding period in 2017. For the quarter, the company recorded a 5% increase in cost of goods sold to close at $19.85 million relative to $18.89 million for the comparable period in 2017. Depreciation fell by 8% closing the period at $1.86 million (2017: $2.01 million). Other operating income totaled $72,894; this compares with an operating income of $61,969 booked in 2017. 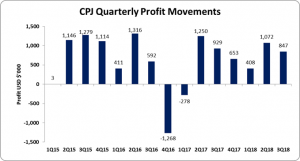 Profit before finance costs, income and taxation improved 13% to total $4.15 million relative to $3.66 million in 2017. Finance costs amounted to $1.36 million (2017: $1.45 million). Finance income decreased by 65% to close at $320 (2017: $909). As such profit before taxation was $2.79 million compared to a profit of $2.21 million in 2017. Net profit attributable to shareholders for the nine months amounted to $2.31 million (2017: $1.90 million), while for the quarter, net profit amounted to $847,119 relative to a net profit $929,172 million booked last year, a 9% decline. As a result, earnings per share (EPS) for the nine months amounted to US0.21cents compared to US0.17 cents in 2017. EPS for the quarter amounted to US$.077 cents relative to US$0.084 cents. The trailing twelve month EPS amounted to US0.271 cents. The number of shares used in our calculations amounted to 1,100,000,000 units. CPJ closed trading on May 09, 2018 , at J$5.29. As at March 31, 2018 CPJ’s total assets amounted to $60.60 million, a 10% increase from the $55.33 million booked in 2017. The growth year over year was linked to upward movements in accounts receivables (28%) and inventories (11%). Accounts receivables and inventories as at March 2018 amounted to US$18.93 million (2017: US$14.81 million) and US$25.88 million (2017: US$23.23 million) respectively. Shareholder’s Equity totaled $23.88 million (2017: $21.20 million) resulting in a book value per share of approximately US2.17 cents (2017: US1.93cents).